This isn't your Daddy's rifle, or is it? If your Dad or Granddad had an M1A Garand from WWII or Korea, you will find a familiar friend. 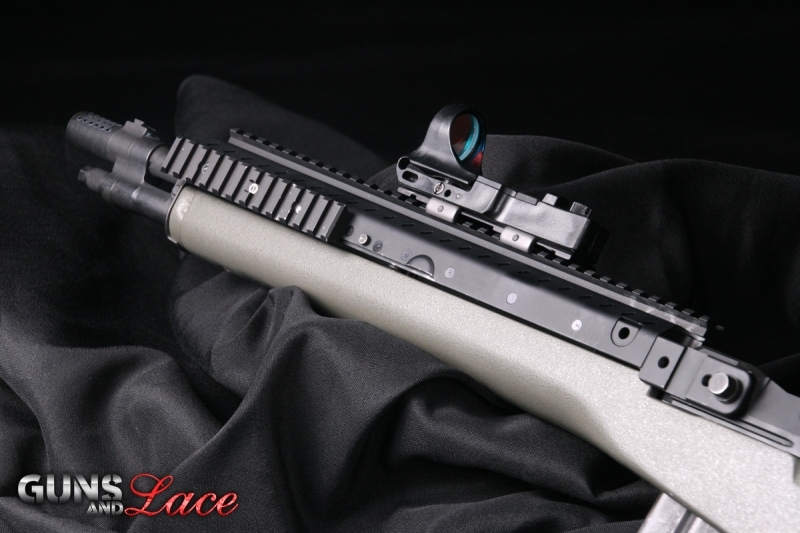 The Socom II is an update of the 2006 Socom 16. 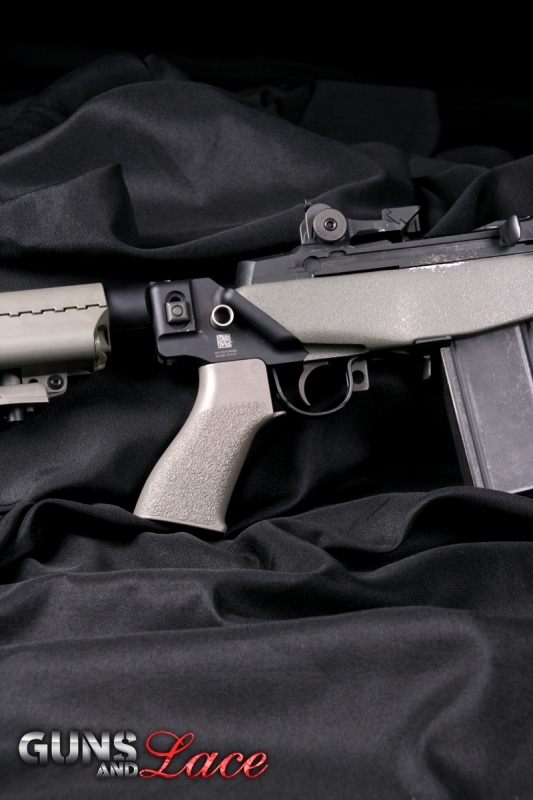 The 16 was a modern rebuild of the M1A, with a box fed magazine and used almost everything else but the stock and sights of a Springfield M1A/ M14. 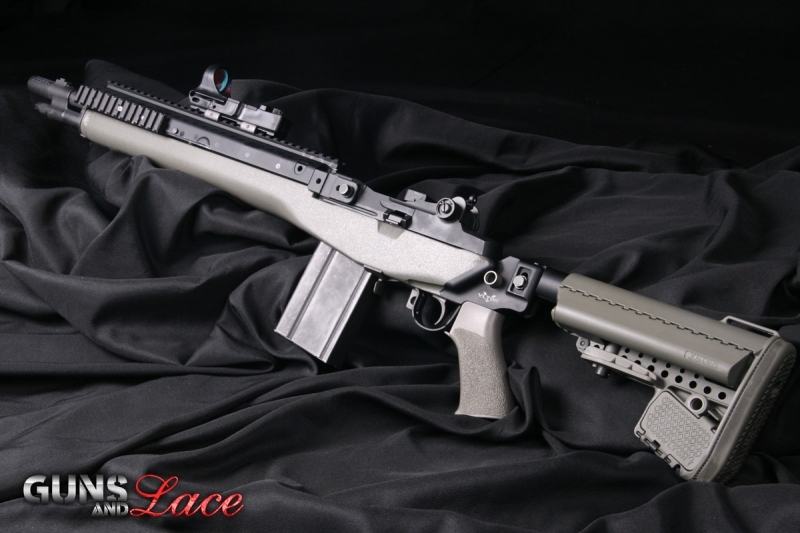 Like the popular 1965 Mustang muscle car that has been rebuilt, the M1A is a thoroughbred rifle, with lots of horsepower under the hood and plenty of performance left in her. Like the Mustang, she was built in huge numbers for the average man, prized by almost everyone now, her price tag has been pushed up many times over her original cost. I love my battle rifles and breathing new life into the workhorse that won WWII is what the Socom II is all about. For a girl that gets all warm and flushed in the cheeks when she sees an M1A, I love seeing the Socum II continue this rifle’s heritage and preserve its pedigree. Built on a new modern composite stock, tritium sites and accessory rails, the Socum II utilizes a modern box magazine (good bye stripper clips)! The rails enable the shooter to add a decent set of optics and modern accessories, and extends the reach out and touch range of the rifle to 300 yards+. We did our test firing at the indoor range, since it was raining cats and dogs on review day. Lanes there are a short 25 yards, so I didn't get a chance to shoot distance and/or brag about long distance groups. I have to say though, on a cold, wet day, the indoor range was warm and dry, and the Socom ll was a joy to shoot. Accuracy was excellent, and I shot several nice tight groups that had the rounds ripping one big hole in the paper rather than punching separate ones. Favorite Quote:"Do or don't. There is no try!" Elizabeth is what we like to call, a hard body! She is as sweet and cuddly as the girl next door, until you see her in work out clothes or a bikini, then OMG!. O% body fat, all muscle, she is a lean, mean fighting machine! At least that's what they say when she is teaching Zumba classes at the gym or in a lane at the range firing her AR15 or this months featured Socum II. She brings the same enthusiasm and passion to the shooting world as her exercise routine. We are shooting buddies, if I say lets go to the range, she is already loading ammo in the car and grabbing her gun bag, before I can let her know what range we are headed to! While Elizabeth is single, she does have children, (no kidding with that body!) and she will do whatever it takes to keep them safe. After all, hell hath no fury like a momma protecting her own! When Elizabeth isn't teaching physical fitness, she enjoys cycling, concerts, and time with her kids. She loves ink and has plans for several new tattoos as time and money permit. She is very pretty ! !